In 2011, an Arizona copy-cat was proposed here in Kentucky, Senate Bill 6. SB 6 would have mandated discrimination by requiring police officers to target people who seem like they might be undocumented. KFTC was part of a broad effort that successfully defeated the bill. Here is what some members said about SB 6. “SB 6 seeks to establish a sanctioned policy of terror that would systematically and willfully persecute Latinos living in Kentucky. It would wrongfully incarcerate innocent people for profit – including women and children. Read an op-ed published in the Georgetown News-Graphic by Scott County member Homer White about SB 6. KFTC is working to create a society that supports the human rights of all people. We value the human rights of everyone, regardless of national origin, race, citizenship, immigration status or any other defining characteristic. KFTC supports our allies in working for comprehensive immigration reform. We also work to defend Kentucky against bad immigration legislation, especially attempts to divide our communities by colors and accents and places of birth. This is not what we want. We want protected communities. We canʼt afford mandated discrimination. We want to stand united. Kentucky canʼt afford to turn neighbor against neighbor. Learn more about the contributions of immigrants to Kentucky here. KCC is hosting Prayer in Action days at the State Capitol each Tuesday during the 2017 General Assembly to pray for government officials and act on behalf of Kentucky’s most vulnerable citizens. Each week will focus on a particular justice issue. Join KFTC and others as we prep members for meeting with elected officials and other decision makers by learning more about the legislative process, good guidelines to go by, practice mock lobbying moments, and more. Free Community Film Screening of Who is Dayani Cristal? Last week’s Jefferson County Chapter meeting kicked off with a brief report from Mary Love about Alliance for Appalachia’s 8th Annual Week in Washington. Mary was a member of the KFTC delegation again this year. The Alliance focuses not only on ending mountaintop removal mining but is also working toward a just and sustainable transition in Appalachia. During the presentation, members shared their ideas for radion programming: story on the mission of St. George’s Community Center, Strange Fruit Podcast on LGBTQ issues, stories from TARC users, biking issues in Louisville, info from AARP, helping folks figure out if they owe taxes, and energy efficiency and renewables. If you have ideas you would like to share or if you want to learn more about WFOR contact Jared at, 502-468-6519 or jaredzarantonello@gmail.com. Last week, a number of Ketucky Immigrant Rights groups got together with allies like KFTC and held the Rally for Immigration Reform and Legalization with Dignity. 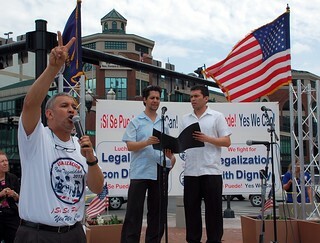 The event was timed in solidarity with numerous other immigrants' rights rallies happening across the US including a main event in Washington, DC.